It is still more likely than not that we’ll make the play-offs but the defeat – and the manner of it – on Tuesday night to Lincoln still feels significant. We went toe-to-toe with a fellow promotion chaser and folded during the game’s big moments, and it’s the second time in quick succession – the previous instance being the Notts County game – where it’s happened. If we do make the play-offs, we’re going to have to toughen up in a very short space of time. Four points from our remaining two games looks, on paper at least, to be eminently achievable – it could be even less if Mansfield fail to take the maximum number of points from their remaining games. However, anything less than a win here against Cheltenham makes it a nervy final day of the season against a Morecambe side that could well need a result to ensure they stay in the Football League. Mark Robins really needs to avoid the temptation to make wholesale changes to the side that lost on Tuesday night. We can’t really afford yet another period without a settled side as those have been the periods where we’ve struggled to get results. It’s not just about holding onto a play-off spot, it’s about doing something with that opportunity to win promotion. While individual members of the back four, and Lee Burge in goal, have come in for criticism for their performances against Lincoln, but any changes will have to be balanced against how they affect the dynamic of the rest of the team. There’s cases to be made for either Tom Davies to come in at centre-back or Chris Stokes to come in at left-back, but either change probably requires having players ahead of them who can create and score chances on their own. The formation and identity of the six players ahead of the back four remains anyone’s guess. The 4-3-3 formation Mark Robins has opted for in the past two games has supplied useful midfield runners, however, it’s come at the cost of leaving our defence more exposed than ever before. In particular, the lack of cover on the right side caused by playing Marc McNulty as a wide forward is a big issue, along with the fact that it leaves our top goalscorer in a position where he rarely threatens the goal. A switch back to a more orthodox 4-4-2 system is a possibility, although that could well mean Tom Bayliss being played on the right, given the current preference for Michael Doyle and Liam Kelly to start in midfield. It also potentially leaves us without attacking thrust on the left should Ryan Haynes be dropped in favour of Chris Stokes and Jordan Shipley played ahead of him. Somehow, we’ve got to the final stages of the season and it’s still unclear what team or formation our manager will pick. Back in early December, when we had been on a poor run of nearly two months without a home league win, or goal, we took on Cheltenham looking to kick-start our season in the post-Jodi Jones era. Mark Robins made a big call in his team selection for that game, starting the unknown youngster Tom Bayliss in midfield, due to an injury to Liam Kelly and a poor showing from Ben Stevenson against Morecambe the previous week. Bayliss made an immediate impression, notching his first goal for the club thanks to a heavily-deflected effort in the second minute of the game. From then on though, Cheltenham started to dictate the game, fashioning several really good opportunities before they levelled via top-scorer Mohamed Eisa. The second-half saw an improved all-round performance from the Sky Blues, but it took an excellent long-range pass from Duckens Nazon to send Marc McNulty one-on-one with the keeper in the 75th minute to give us a lead that we eventually held onto. Cheltenham can’t reach the play-offs, nor can they be relegated, they have won just one of their past six games and look like a team waiting for the season to end. Nonetheless, they are the top scorers in League Two out of the teams currently outside the top five and should not be taken lightly. Striker Mohamed Eisa is clearly Cheltenham’s chief attacking threat, with 24 goals all to himself this season. Signed from non-league Greenwich Borough, Eisa has improved over the course of the season as he’s adapted to full-time football, becoming increasingly clinical in front of goal. With his pace and skill on the ball to complement his finishing, Eisa is someone who looks set for a move to a top-half League One or lower Championship side over the summer. The tall Harry Pell in midfield has consistently been a key player since Gary Johnson’s appointment as manager nearly three years ago, capable of popping up with the odd goal. Pell has been complemented this season thanks to the improved form of the box-to-box Carl Winchester – who can also operate at full-back – and Bristol City loan signing Joe Morrell, who is a set-piece expert. The rest of the Cheltenham side is fairly functional, although left-back Ilias Chatzitheodoridis has been a good January loan signing from Brentford. 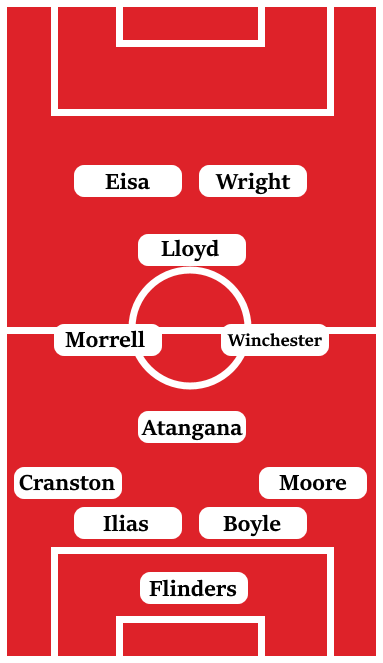 Eisa is usually partnered in attack by an experienced target-man in either Danny Wright or Brian Graham – which could cause us problems based on how we dealt with Matt Rhead on Tuesday. In defence, Cheltenham lack pace and have leaked goals this season to undermine what could possibly have been a play-off tilt based on their attacking play. Moreover, Cheltenham are a side that can get on the ball at times and play through their midfield, while they also pose a threat from set-pieces. With one of the division’s best strikers this season on their books, they could really put us to the sword if they have a good day. We can’t afford to take this game lightly, neither can we approach it in the fraught manner that a team looking to react to a high-profile defeat usually does. This is a game where cool heads will be the order of the day, on an occasion where we could potentially either secure a play-off spot or drop out of the top seven heading into the final day of the season. I anticipate this being an edgy contest from our perspective and I can see this being a relatively high scoring game at both ends, 2-2 draw.